The next generation of Rotorgeeks motors has arrived! We've taken the wildly popular 2205-2700kv motor (the one that started the high kv trend), and upgraded the material to 7075-T6 aircraft grade aluminum, with almost 3 times the tensile strength of traditional 6063. The case design has been re-engineered for maximum strength and impact resistance. More material in key structural areas, spans, mounting hole clearance and other potential points of failure in a high speed impact. Shafts are secured into the rotor both mechanically and with a high strength adhesive to make shaft slippage and vertical play a thing of the past. The shaft is now held in place at the base with a standard e-clip, making servicing and parts replacement easier than ever. 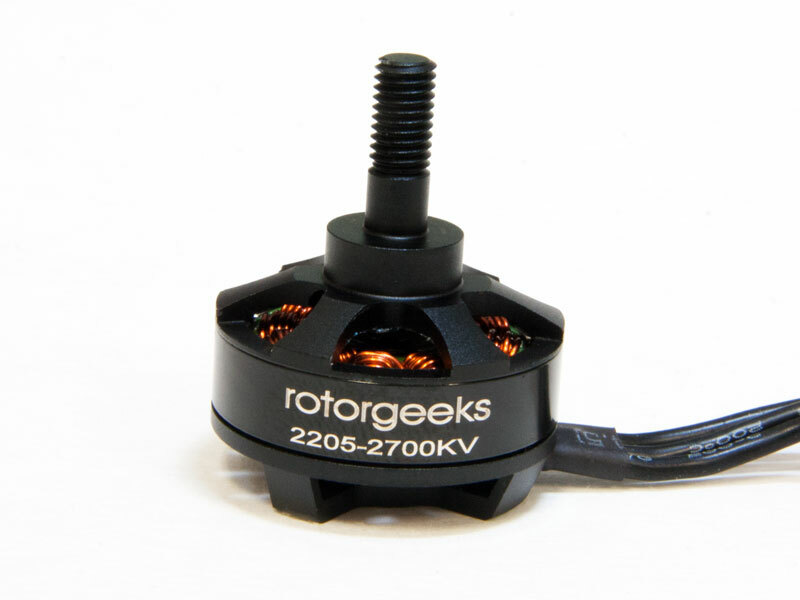 The 2205 motor takes on 2g of additional weight compared to the RG 2204 and provides significantly more power. 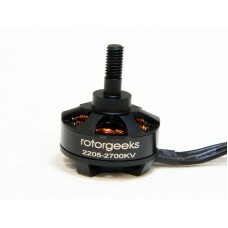 The second of a series of high performance multirotor motors designed and manufactured to our specs. These are not simply rebranded motors. Every element has passed rigorous design, lab and flight testing over a 6 month period and is a reflection of our perspective on what makes an ideal multirotor motor. Each motor comes with a hardware kit that includes a nylock nut, standard nut and M3x6 hex head motor mount screws and washers. The screws are good for arms ranging from 2.5 - 4mm thick.